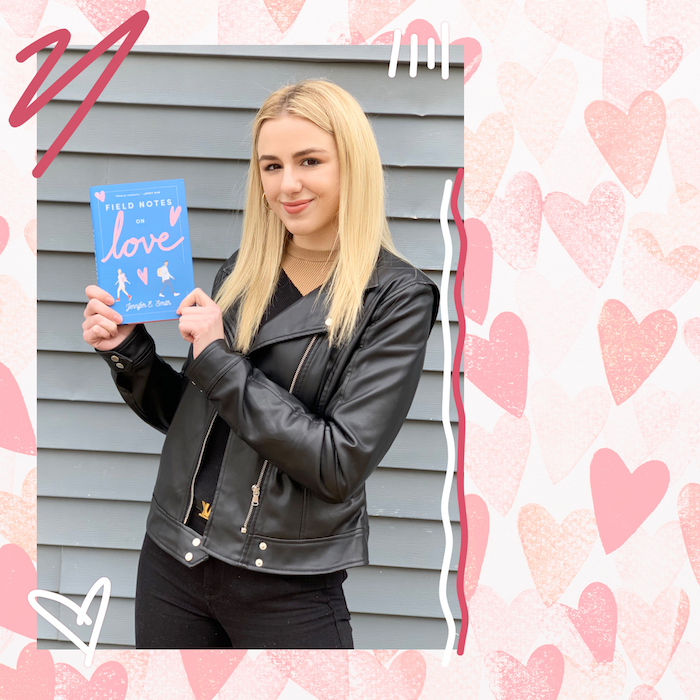 Welcome back to Chloe’s Book Club — a community for book lovers from Chloe Lukasiak and Girls’ Life magazine. If you're new here, hello and welcome, book lovers! Here's how this works: Each month we read, discuss and obsess over a new book; so if you haven’t signed up already, be sure to CLICK THIS LINK and officially join the club. We’ll email you with Chloe’s Book Club updates, reading guides, special contests and giveaways, event invitations and more. Here's a quick list of everything you'll find inside this post (and beyond). Just remember, *major spoilers* are ahead (so look for the spoiler ratings before you read!). The swoon-worthy April edition of Chloe’s Book Club stars Field Notes on Love by Jennifer E. Smith, the story of two college-bound strangers who fall in love during an impromptu cross-country train trip together. To get 15% off your copy, head over to Barnes & Noble and use the code chloereads at checkout (offer available through April 30, 2019). Or, if you're shopping in store, CLICK HERE to snag a coupon. Pssst: Be sure to share the discount with all the friends in your book club! Hugo had everything mapped out: The Brit teen was going to take a cross-country train trip through the US with his longtime girlfriend to celebrate his birthday. He was going to attend a local university on a generous scholarship alongside his siblings. And he was going to carry on just being Hugo, a complacent sextuplet with everything planned out for him. But that all changes when Hugo gets dumped. Which means no more loving girlfriend *and* no more birthday trip—not even the chance of a solo journey. Because his ex-GF booked everything in her name—Margaret Campbell—Hugo can't board a single train or check into a single hotel without her. As Hugo wallows, he gets plenty of sympathy from his five sweet sibs: Alfie, George, Oscar, Isla and Poppy. But then he has an idea—and Hugo places an ad to find a *new* Margaret Campbell to accompany him from New York to California. To his surprise, he receives a few responses...and his circumstances actually start to look a bit brighter. One of those responses comes from Mae (short for Margaret) Campbell. The New Yorker has just been rejected from her dream film school, University of Southern California, and she’s in need of a serious pick-me-up. When she sees Hugo’s ad, she decides to take a leap of faith and throw her hat in the ring. So the pair set out, traveling together but on completely separate journeys: Mae is determined to experience the world and create a new film—one that the admissions board of USC loves enough to grant her a spot in their film program once and for all. Hugo, meanwhile, is simply looking to see the States and take a break from being a dumpee and a sextuplet for a bit. Then something unexpected happens. Between the soaring skyscrapers of Chicago and the breathtaking Rocky Mountains in Denver, sparks begin to fly between Hugo and Mae. The pair realize that while they were busy interviewing fellow travelers about ~love~ for Mae’s next movie, they themselves were falling for each other. 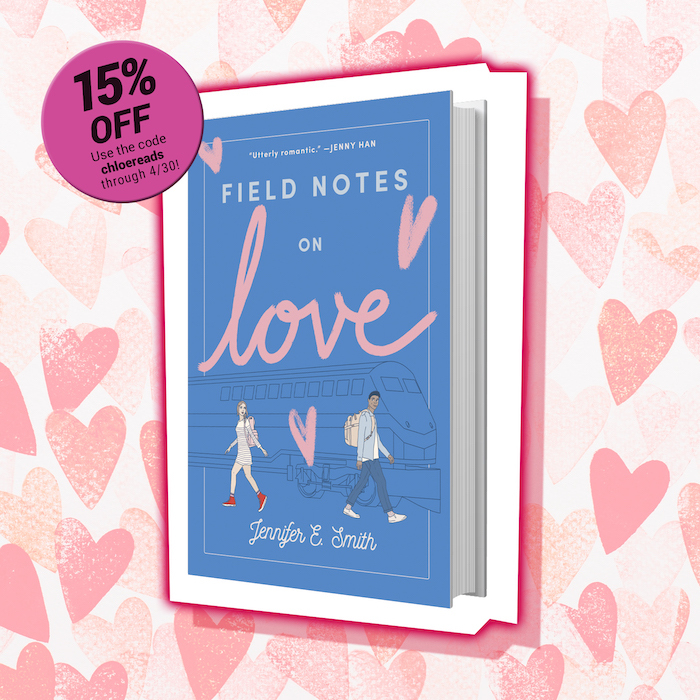 Told in dual perspectives, Field Notes on Love reminds us of the importance of taking chances—and that love will find you when (and where) you least expect it. You guys, I think I've officially turned into a softie because I 100% cried when I finished Field Notes on Love. I read it *so* quickly (you know me—once I start reading, sometimes I just can't stop) and when I got to the final sentence I was just a little overwhelmed. I won't spoil it for you, but, wow. Know this: I shed many, many tears...but they weren't sad ones. Here's the thing: I’ve dated in the past and I've really liked people—and maybe even thought I loved people—but I've never come close to having something as intense or as true as what Mae and Hugo have (those two are definitely on a soulmate level of love!). Despite that, what actually touched me so much about this book was all the different types of love that the author, Jennifer E. Smith, explores within it. There's the platonic love between Mae and her best friend, Priyanka. The pair complement each other so well: Priyanka is an absolute romantic. She's been dating her boyfriend for years, and they're so committed to each other that they're doing the whole long distance thing in college. Meanwhile, Mae had fun with her summer fling...but she never really let him in enough to create a real connection. It's Mae and Priyanka's differences that make them such great best friends. Their connection actually made me think of the friendship I have with Kalani Hilliker. We’re always supportive of each other, but also really real—just like Pri is with Mae when she’s trying to explain to her why she should be more opened hearted. Then there's the familial love between Hugo and his siblings. Hugo is a sextuplet, which means he's one of six (!!!) kids born at the same time. He definitely seems a little smothered by them (and the general expectations of being a sextuplet) sometimes, but they all really love each other. Their text messages throughout the novel ranged from silly to supportive to serious, and each one made me smile. I love how much love they have for each other! It made me appreciate my Bean (aka my little sister, Clara) that much more. Lastly and perhaps most importantly, the novel obviously revolved around the romantic love between Hugo and Mae, and—ah! Their story is so, so sweet and cute. And what I loved most about it is that it reminded me of my grandparents. They serendipitously met when they were in seventh grade after their english teacher sat them next to each other and told them they would make a great couple. If it wasn’t for fate—and their teacher—I literally wouldn't be here. Forty-seven years later and they’re still going strong. They were over my house the other day and I could tell by the way they were joking together just how much they love each other, and it made my heart happy. It’s so evident that what they have is so rare and lovely. I definitely think they're soulmates. When I really think about it, what they have makes me believe in true love and in finding my own soulmate. And at the end of the day, I want to experience something like they have—and like Mae and Hugo have. I won't settle for anything less. In our April playlist, we're crushing on quite a few ooey-gooey love songs. Because are you even crushing if you can't find the perfect song and express your feels through spot-on lyrics?! Read on for three Field Notes on Love-inspired playlist picks by Lauv, Julia Michaels, Johnny Orlando, Zedd and Alessia Cara. Then, press play for the rest of the 😍jams. 1. There's No Way (featuring Julia Michaels) by Lauv. As soon as Hugo and Mae met, we just *knew* there was going to be something between them...and deep down, the pair probably did, too. That's exactly what Lauv and Julia Michaels express in this song. It's so heartfelt and touching, and gives all of the "omg, I think they like me!" vibes. 2. "Sleep" by Johnny Orlando. "And I don't wanna fall asleep now / Because being with you right now / Is better than our dreams now." Sharing a cramped train cabin with a stranger is what both Hugo and Mae considered to be a less-than-ideal situation when their trip first started. But as it turns out, a few late night convos were all they needed to shake off any awkwardness. Just like Johnny, they came to realize that deep talks are even better than dreams. 3. "Stay" (with Alessia Cara) by Zedd. When Mae had to make the trek home to be with her family, we were basically melting. "Stay with her, Hugo!" is all we could utter for days. The pair traveled *so* far and overcame so much (mostly Hugo's forgetfulness 😅) in order to be together, which made the eleventh-hour change up so gutwrenching. But you know what they say: Sometimes things have to fall apart before they can fall together. 1. When we first meet Mae, we learn that she has been rejected by her dream college. She's devastated, of course, but she commits to persevering and applying again as soon as she can. Have you ever been rejected, whether it was by a crush, a school, a friend, a team, a job or something else? How did it make you feel? How did you push past it, and how did you attempt to better yourself afterward? 2. On page 123, Hugo and Mae share their first kiss. What was your first kiss like compared to theirs? If you haven't had yours yet, what do you imagine it will be like? 3. On page 141, Mae's grandmother tells Hugo that oftentimes when Mae is filming, she’s so focused on getting a great angle that she'll trip and fall because she's not paying attention. In other words, she's wildly dedicated to her craft. What are you passionate about? Why do you love it? Do you do it just for fun, or is it something that you'd like to make a career out of? Explain. 4. Throughout the end of the novel, Hugo considers taking a gap year before college. This would give him the opportunity to travel, spend time with Mae and explore his passions before heading off to college with his siblings. Would you ever consider taking a gap year? If so, what passions and interests would you explore during your time off? How do you feel a gap year would benefit you (or not benefit you) in the long run? 5. [Note: *Major* spoiler alert coming up on this one!] On page 226, Mae learns that her grandmother has passed away after battling cancer and enduring several strokes. This is a blow to Mae personally, but a wake-up call for her creatively. In the end, she is able to honor her grandmother's memory through film. Have you ever lost someone close to you? If so, how did it make you feel, and how did you honor them after they were gone? 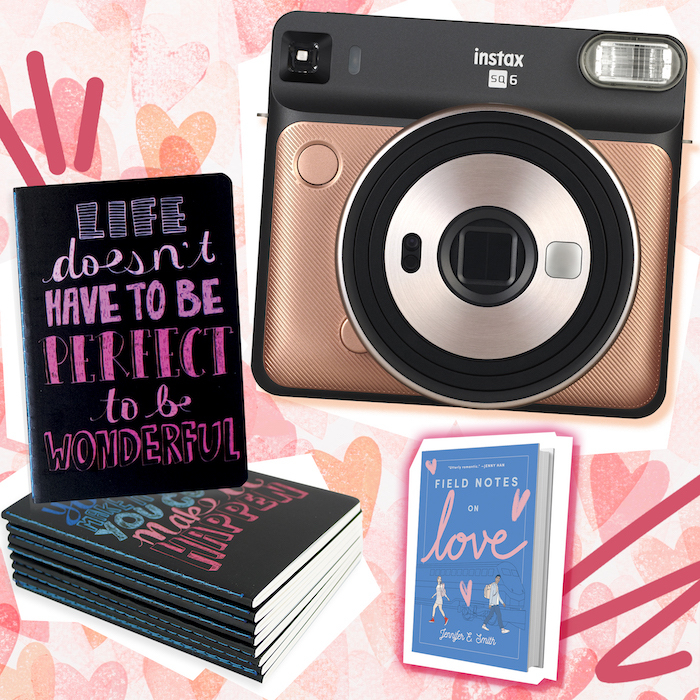 One camera-ready cutie will win a fab Field Notes on Love prize pack, which includes a Fujifilm Instax Square SQ6 camera in Blush Gold, a set of totally inspirational notebooks from Ooly (for taking your own field notes on love—and anything else) *plus* a copy of the book itself. Ready to enter—and, fingers crossed, win? Click HERE to enter. + SOLO. Take your personal reading game to the next level by using Chloe's discussion questions as a guide for your own journaling and personal reflection. If you love to read, it could be fun to start a special book diary where you keep track of all your favorite novels—and the personal musings they inspired. + WITH YOUR SQUAD. Host an IRL book club party, of course! Check out the playlist for music ideas and Chloe's discussion questions for convo starters — then be sure to tag us in your snaps so we can share them.